Are you tired of dealing with endless, excessive sweating? Are you constantly applying antiperspirant because you’re afraid of ruining your clothes or being caught with embarrassing sweat stains by friends and colleagues? Toronto Doctors treat Underarm Sweating! Since 2001, thousands of happy patients. Get in touch today for an affordable Hyperhidrosis treatment! • Our Doctors assess each patient personally, take a proper medical history and perform the injection procedure. The procedure is very simple and many patients come by over their lunch hour or after work. • Our central location and ease of access. Call today at 416-515-0007 to set up your visit and speak to one of the doctors. The procedure is very simple, safe and not painful. The Doctor injects 8-12 spots in your underarm area, and no anesthetic is necessary. Again, the needles are tiny, the type used by Diabetic patients to inject their insulin. After the treatment you can go about your normal day to day activities, go right back to work or to the gym. Over the next week you will slowly notice that your sweating is decreasing, and after 8 – 10 days you should be virtually dry. Many patients call or email after their first treatment to tell us how amazed they are that Botox works so well for Hyperhidrosis. Around half of our new patients Toronto are referred by friends or family that have visited us for other treatments like Cosmetic Botox , Laser Hair Removal or sclerotherapy and noticed that we treat excessive sweating as well. The cost is generally covered to some degree by group plans of major insurers. They vary in the amount that they cover so please check first. At your initial visit we can give you a draft letter to send to your insurer so that you can be pre-approved. We charge $750 for 100 units of Botox, but the standard dose is 200 units (100 units per arm), and the fee is $1100. There is no HST. Most group plans cover 70% or more of the cost. Hyperhidrosis is a very common condition that effects about 3% of Canadians. It causes a lot of stress and anxiety, partly because many patients do not realize it is manageable. 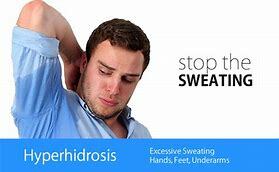 Fundamentally it is excess sweating, beyond what one would normally expect in day to day activity – it generally is found in the underarms (axillary hyperhidrosis), feet (plantar hyperhidrosis) and hands (palmar hyperhidrosis). Usually the sweating starts in the underarms around the age of 18; many patients tell us they first noticed it in high school. Feet and hands typically start around puberty or age 13. Although in some cases hyperhidrosis lessens with time, if it is not caused by another medical condition, most patients find it lasts a lifetime if not treated. Patients typically tell us their major concern is embarrassment. They tire of sweating through their close and feel awkward at work or in social situations. In the most severe cases of underarm hyperhidrosis patient shave to change their clothing up to 3 times a day, and it really interferes with their activities of daily living. There are several medical conditions that can cause excessive sweating (sometimes called Secondary Hyperhidrosis), so it is important to discuss your condition with a Doctor. Typically, at our Toronto Hyperhidrosis Treatment Clinic, patients have already been screened by their family doctors, and have a clean bill of health, this entails having blood tests and a physical exam to rule out the conditions that could cause excessive sweating, such as certain thyroid gland or other hormonal conditions, or certain neurological or infectious diseases. In most patients excess sweating is caused by Primary Hyperhidrosis. They simply have overactive sweat gland in the areas where they perspire. Often there are certain triggers such as heat or anxiety, but many patients tell us that they sweat always of day, regardless of the weather or how they feel. Botox blocks the nerves that activate the sweat glands. Under normal circumstances, the nervous system turns on your sweat glands as the temperature of your body goes higher. This is a vital homeostatic mechanism that prevent us from overhearing and becoming dehydrated. In those who suffer with hyperhidrosis, the nerves that control sweating are overactive. Botox is injected into the areas where you sweat, and it targets those sweat glands in that specific area. It causes the nerves to stop signalling your body to sweat, but only where the Doctor places it. It does not affect any other part of your body. In a very small number of cases, patients may find slightly increased compensatory sweating, often in the small of the back. But typically, if this does occur, it is much more preferable than their underarm sweating, which causes significant distress. How is my sweating evaluated? • What parts of your body are affected? • How often does sweating occur, and do you sweat while asleep? • Do you carry towels, pads, or extra anti-perspirants with you during the day? Does hyperhidrosis affect your behavior or mental state when you are in public? • Do you feel your work has been affected by your excessive sweating? • Has it affected your social life, or caused embarrassment in social settings? • How often must you change your clothes; do you avoid certain colors? • How often do you have to shower or bathe? • Do you feel anxious or depressed when thinking about your excessive sweating? • Do you ever feel sad or angry about your excessive sweating? • How would you rate the effect the sweating is having on your life on a scale from 1 – 10? Unfortunately, less than 40% of people suffering with hyperhidrosis receive treatment. At our Toronto clinic we often see patients who have suffered unnecessarily for years, unaware that there are helpful solutions to their excessive sweating.This is truly a shame, since for many the excessive seating is disrupting their normal activities of daily living. By using a systematic evaluation of the possible causes and a discussion of the individual triggers for a person’s excessive sweating, followed by a careful and scientifically valid approach to treatment, most patients can achieve significant improvement and vastly improve their quality of life. • Avoid wearing heavy clothes whenever you can, since these tend to trap sweat. Instead, try wearing lighter, breathable types of fabrics like cotton, various athletic gear, or even silk. When you know you’ll be outside in the heat, or if you are heading to the gym for a workout, plan and bring a change of clothes. • Shower or bathe daily and try using antibacterial soaps. These can control the bacteria that colonize your sweat and cause unpleasant odors. Make sure you are totally dry afterwards, and then apply your over-the-counter or prescription strength antiperspirant. • Some patients find underarm pads can help, they absorb sweat and are useful if your hyperhidrosis is not severe. Likewise, there are footpads that can be inserted into your shoes. • Avoid your triggers. For many people this means alcohol and spicy foods. Try to keep a mental diary of the situations and products that increase your sweating and try to minimize them. • By using over-the-counter antiperspirants that contain low doses of aluminum chloride. These are usually tried first because they are readily available. These can be helpful in many individuals, but at our hyperhidrosis clinic we often see patients who have either found this to be less than totally effective, or they complain of the irritation it causes to their skin and have discontinued its use. • When regular antiperspirants fail to control excessive sweating, we recommend aluminum chloride hexahydrate, which goes under the trade name of Drysol. This is a prescription-strength aluminum chloride, and it is applied before bedtime for a few nights in a row, and then followed perhaps once or twice a week as needed. • The main side effect of Drysol is irritation, which can sometimes, but not always, be overcome by making sure the skin is dry before application and letting the medicine dry completely afterwards. Also, reducing the frequency of use or applying anti-inflammatory drugs, such as lotions containing a corticosteroid may help. This is a method by which an electrical current is placed directly into the skin, blocking sweat ducts. Usually the patient purchases a machine online and uses this device at home. It is not commonly used anymore, but some patients might find it worth a trial. Water conducts an electric current to the skin; this is done several times each week, with each session lasting bout 30 minutes. If control is achieved, it can then be done weekly as a maintenance. Some insurers may cover the cost of a machine. Oral medications can be used, like certain anti-cholinergic, but often patients cannot tolerate the side-effects such as dry mouth or dizziness. Botox (botulinum toxin)-A, which has Health Canada approval for hyperhidrosis if the underarms. It is effective, and a brief visit can produce result that may last up to 18 months. The average patient gets 8-12 months of completely dry underarms or minimal sweating controlled by regular anti-perspirant. Botox is a toxin that can temporarily paralyzes muscle, and is famous for its use in cosmetic procedures, but it has been used for many years for a variety of medical treatments ranging from muscle spasms to migraines. We inject a very small amount of Botox in 8-12 areas of your underarms. This is not painful as the needles are hair thin. There is really no downtime or post-procedure instructions to worry about. Now that this treatment has received FDA approval for hyperhidrosis, many health insurers are providing coverage for the injections and the Botox itself after other treatments have failed. Thoracic sympathectomy is an operation that destroys the nerve supply to the sweat glands. The surgeon inserts an endoscopic into the chest below your armpit. They can either cut the nerves, which is irreversible, or clamp them, which can be reversed. This surgery is effective but can be risky. Complications include excessive sweating starting in other areas of the body. However, at our Toronto Sweating Clinic, we often refer patients for consolations for this procedure if they are interested, especially if their hyperhidrosis requires Botox more than every 6 months, it is an OHIP covered surgery, but unfortunately the waiting times can be quite long.